August | 2007 | KBK Bakery's Adventures in Baking! Oatmeal Peanut Butter Chocolate Chunk Cookies! phew! That’s a long title, but a darn tasty cookie! The cookies are very easy to make and you drop them on a pan like you would chocolate chip cookies. I found this recipe through Google. It came from a downloadable PDF file at http://base.google.com/base/a/1493989/D9449485058945114584. This PDF file has 604 different chocolate recipes! It was like looking through a treasure chest of tasty tidbits! I found several recipes I would like to try, but this one struck my fancy today. flour. Stir in rolled oats with a wooden spoon. Stir in chocolate kisses. edges are lightly browned. Transfer to wire racks and cool. Store in an airtight container or plastic bag at room temperature up to 3 days. Makes 60 to 72 cookies. container easily. Freeze up to 1 month. I loved this recipe because the only thing I had to go out and buy for it was the mini chocolate chips! Of course, the recipe calls for mini chocolate kisses, but I misread that! I’m sure they are just as tasty with the mini chips though they are probably not “chunk” cookies anymore! The house smelled of these wonderful cookies for hours after they were finished. The cookie is unusual, in my opinion, because you can actually taste the different components. Often in “busy” cookies with lots of stuff in them the individual flavors get lost, but in this cookie you could really taste the oatmeal, the peanut butter, and the chocolate. I will definitely be using this recipe for my next cookie exchange! Or at least recommending it. I don’t go to that many cookie exchanges. Maybe I’ll start one! Working together with a stand mixer, preferably fitted with a paddle attachment, or with a hand mixer in a large bowl, beat the butter and sugar together on medium speed until pale, about 2 minutes; the mixture may be crumbly. Scrape down the sides of the bowl , add the eggs and vanilla and beat for another 2 minutes; don’t worry if the mixture looks curdled. Reduce the mixer speed to low and mix in the dry ingredients in 3 additions, mixing only until dough forms. Scrape down the sides of the bowl. Mix in the chopped nuts and chocolate, then turn the dough out onto a work surface and knead un any dry ingredients that might have escaped mixing. Divide the dough in half. Working with one half at a time, roll the dough into a 12 inch long logs. Flatten both logs with the palm of your hand, so that they are 1/2 to 1 inch high, about 2 inches across and sort of rectangular, then carefully lift the logs onto the baking sheet. Sprinkle each log with a little sugar. Bake the logs for about 25 minutes, or until they are just slightly firm. The logs will spread and crack-and that’s fine. Working with one log at a time, using a long serrated knife, cut each log into slices between 1/2 and 3/4 inch thick. Stand the slices up on the baking sheet-you’ll have an army of biscotti-and bake the cookies again, this time for just 10 minutes. If you want you can melt some white chocolate in a double boiler. Pour it into a shallow baking dish. Take the biscotti and dip which ever part you would like to be covered in chocolate. Set on a rack to harden. The biscotti came out pretty well, although not as dry and crunchy as the ones from the store. Which was fine with me, as the ones from the store hurt my poor gums. I’m sure I just need to bake them longer or something, but I kinda like the way they came out. They tasted mighty fine with my coffee this morning! The only change I made was to use pecans for the nut, as I am a lover of pecans and Katie apparently prefers them as well. I also, fairly obviously, used a darker chocolate for the dipping portion. Bittersweet, to be exact. It was highly recommended to eat them topped with the whipped cream from the spray bottle – I am not a fan of the whipped cream from a bottle, but it wasn’t half bad. 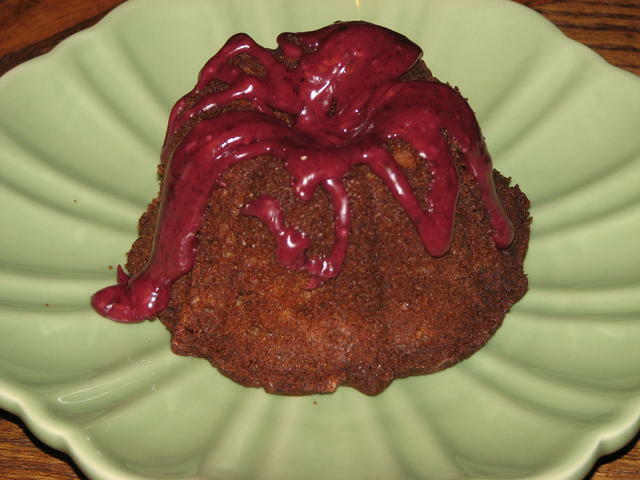 I tried to make Blackberry Jam cakes the other day. I used a recipe I found at Culinary Concoctions by Peabody (http://www.culinaryconcoctionsbypeabody.com/) The recipe was really easy! I don’t make too many cakes from scratch but these are pretty tasty! You don’t taste the jam much in the cake but the icing is very flavorful. Cream together butter and sugar. Add eggs one at a time and scrape down the bowl after each egg. Add the vanilla a beat for another 30 seconds. Sift together flour, cinnamon, nutmeg, salt and baking soda. Add to butter mixture alternately with sour cream, beating after each addition. Fold in the blackberry preserves. Pour into a buttered and floured 10-inch Bundt or tube pan (I used mini). Bake at 300F˚ for 15 minutes. Increase heat to 350F˚ and bake until done (40-50) minutes. If making the mini, bake about 10 minutes less. Cool in pan 10 minutes. Turn out onto wire rack to finish cooling. If you want to make the glaze (no real recipe) simply heat up some jam. Remove the jam from the heat when it has melted and sprinkle in some powdered sugar until you reach a consistency you are happy with. I used regular all-purpose flour in mine, as my local Meijer didn’t have cake flour. The cakes were a bit dense for my taste, but that may be because of the flour difference. They are excellent with coffee as well as served warm with vanilla ice cream. Yum! We’ve decided to start trying out new recipes and posting our results online! Fun, huh? Our first “foodie” post should be out tomorrow! Look for it and we’ll keep you posted! You are currently browsing the KBK Bakery's Adventures in Baking! blog archives for August, 2007.